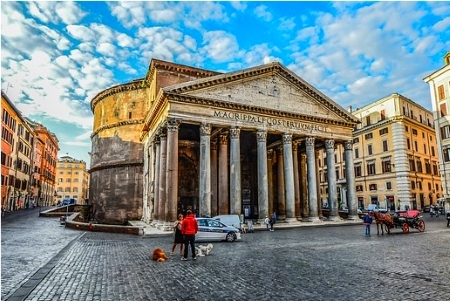 The Pantheon in Rome 2019 - Is the visit worthwhile? The Pantheon is an ancient building in today’s city centre of Rome. It is the best preserved ancient building in the city. The Pantheon is an impressive building due to its size and architecture. It belongs to the top 5 sights in Rome and does not cost an entrance fee (as of the beginning of 2019). But this could change soon (see below). Every day many people, especially tourists, come to the Pantheon. The round building fascinates practically every visitor from the first second. It is a circular building with a diameter of 44 meters. In the center there is a gigantic dome with an opening in the middle, through which sometimes sunlight shines into the building in an impressive way. 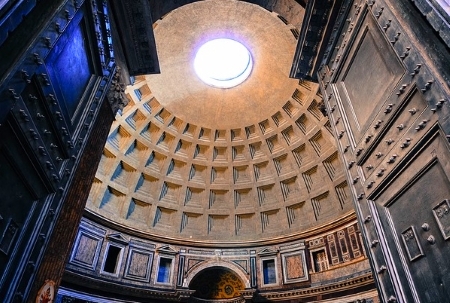 The Pantheon was completed in 128 AD under Emperor Hadrian. In this pre-Christian period in Rome, the rotunda was a temple built in honour of the gods. The name Pantheon is Greek, the meaning is „All Gods“ (pan = all, theos = God). After the Christianization of Rome the Pantheon became a church. The ancient building still has this function today, even though the Pantheon is now mainly a tourist attraction. The probably most spectacular part of the Pantheon is the Ocolus (also Opaion), a round opening in the middle of the dome with a diameter of 9 meters. Sunlight penetrates through this hole into the building. When the weather is clear, the sun often illuminates a sharply defined, round area inside the Pantheon. Depending on the position of the sun, part of the wall or floor of the building is sunlit. With the movement of the sun in the sky, this area naturally also moves. When it rains, the ground in the Pantheon gets wet. It is a real opening without glass. The antique building does not have other windows, light penetrates only through the hole in the ceiling. In later artistic epochs, such as renaissance, the idea of the dome with opening (Ocolus) was often copied. Nevertheless, for about 1500 years the building was the largest dome in the world. Moreover, the Pantheon in Rome is the tomb of some very famous people. The most famous grave is the one with the painter Rafael (1483 to 1520). We last visited the Pantheon in January 2019. Since there are less tourists in Rome in winter, we didn’t have to queue long. There were minor entry controls. The Pantheon is officially a church. Therefore, as usual in Rome, you cannot visit the sight with shorts or uncovered shoulders. As far as we know, cameras (film and photo) are only allowed in the Pantheon without flash and tripod. Otherwise the usual prohibitions apply in a church like eating, drinking, smoking, dogs and mobile phone ringing or phoning. For a fee you can rent an audio guide in the Pantheon (in 8 languages including English, worth it). Also worth seeing is the square with a fountain in front of the round building. The Pantheon does not cost an entrance fee so far (as of the beginning of 2019). According to some media reports in 2017 and 2018, an entrance fee is planned for the near future. It remains to be seen whether the new city government under Mayor Virginia Raggi of the Five-Star Movement will actually introduce an entrance fee for the Pantheon. The Pantheon is open during the week (Monday to Saturday) from 8:30 to 19:30, on Sunday from 9 am to 6 pm. Sometimes, however, there are services in the Pantheon, so it is not possible to visit the ancient building. Church services are, for example, on Saturdays at 5 p.m. or on some days, such as public holidays, in the morning. Only on 3 days a year the pantheon of the whole day closed for visitors: New Year, 1 May and Christmas (25.12). Only 200 meters away is the square Navona, one of the most beautiful squares of Rome. The most famous fountain in the world, the Fontana de Trevi, is at a distance of about 400 meters from Pantheon. Up to the Spanish Steps, for many the center of Rome, it is about 700 meters. The antique building is located directly in today’s city centre.